Shout-out from Jeffrey Agrell Himself! How cool to receive a shout-out from the creator of my some of favorite improv exercises! 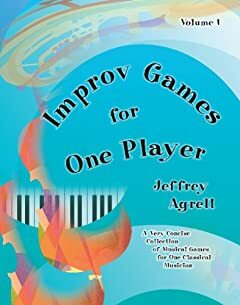 Jeffrey Agrell, author of Improv Games for One: A Very Voncise Collection of Musical Games for One Classical Musician, linked to recent post of mine on an improv session with David Elkin-Ginetti. I’ve been a reader of Agrell’s blog, Improv Insights, for a while – it’s really motivating to hear from a music educator who is so passionate about the power of improvisation and creativity – check it out! This entry was posted on April 18, 2013 by natetrier. It was filed under Uncategorized and was tagged with agrell, books, improv, improvisation, music.